In the town the population was spread out with 18.0% under the age of 18, 3.7% from 18 to 24, 23.0% from 25 to 44, 38.0% from 45 to 64, and 17.3% who were 65 years of age or older. The median age was 48 years. For every 100 females there were 94.7 males. For every 100 females age 18 and over, there were 93.1 males. The town is famous for lending its name to the Woodstock Festival, which was actually held at Max Yasgur's dairy farm almost 60 miles (97 km) away in Bethel in Sullivan County. The 1903 Byrdcliffe art colony is one of the nation's oldest Arts & Crafts colonies. It brought the first artists to Woodstock to teach and produce furniture, metal works, ceramics, weaving and established Woodstock's first painting school. Byrdcliffe forever changed the cultural landscape of the Town of Woodstock. In 1916, utopian philosopher and poet Hervey White built a "music chapel" in the woods. This became the home of the Maverick music festival, the longest-running summer chamber music festival in the country, still held annually as of 2012. Composers such as Henry Cowell, John Cage, Robert Starrer and Peter Schickele created works that were premiered there. Today, this hand-built concert hall with perfect acoustics, is a multi-starred attraction on the National Register of Historic Places with world-class musicians playing there from June to September. Hervey White also hosted numerous young artists at the Maverick colony, including Lucile Blanch, Arnold Blanch, John Bernard Flannagan, Eugene Ludins, and Hannah Small. Ohayo Mountain – A mountain to the east, between the Ashokan Reservoir and Woodstock village. 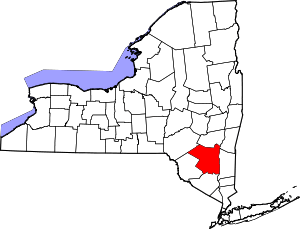 Saugerties, New York – A nearby town that includes the 800-acre Winston Farm, the original site for Woostock '69 and home to Woodstock '94, and host to the Garlic Festival and Horse Shows In The Sun (HITS) north of the village. Saw Kill – A stream that rises in Echo Lake, flows west through Shady, then south to Bearsville, east to Woodstock, and southeast to Zena on the way to its confluence with the Esopus River near Kingston. 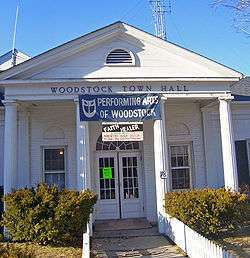 1 2 "Geographic Identifiers: 2010 Demographic Profile Data (G001): Woodstock town, Ulster County, New York". U.S. Census Bureau, American Factfinder. Retrieved June 17, 2014. ↑ Wolf, Tom and Rhoads, William B. "The Maverick: Hervey White's Colony of the Arts" (Woodstock Artists Association and Museum, 2006), pp. 11-31. ↑ Wolf, tom.Woodstock's Art Heritage: The Permanent Collection of the Woodstock Artists Association (Woodstock: Overlook Press, 1987). ↑ "National Register of Historic Places Listings". Weekly List of Actions Taken on Properties: 3/04/13 through 3/08/13. National Park Service. 2013-03-15.